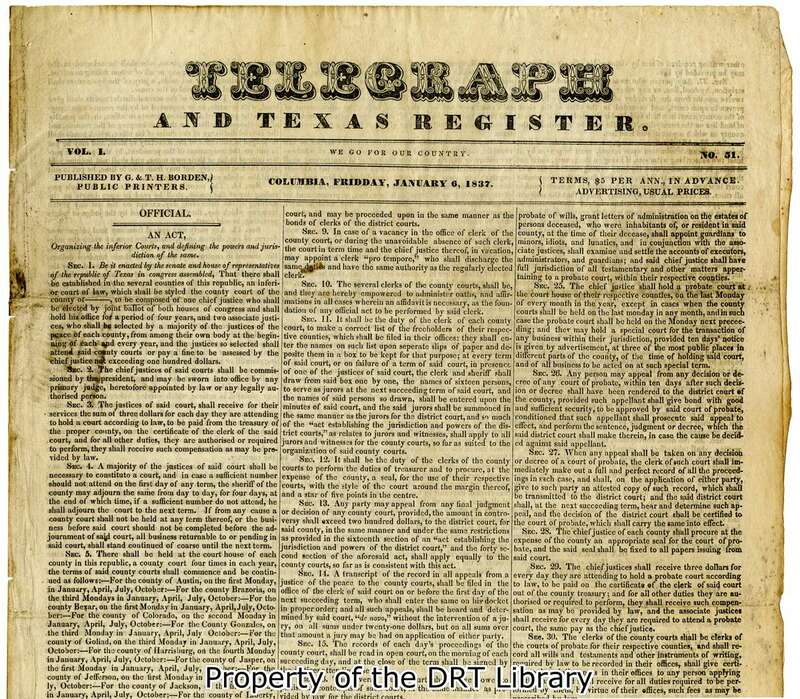 Copy of the Telegraph and Texas Register. Courtesy of the Daughters of the Republic of Texas. Image available on the Internet and included in accordance with Title 17 U.S.C. Section 107. MOHL, AURELIA HADLEY (1833–1896). Aurelia Hadley Mohl, journalist and writer, was born on June 10, 1833, in Jackson, Mississippi, the daughter of Col. and Mrs. T. J. B. Hadley. She moved with her family to Houston at age seven and in 1851 married Frederick Mohl. They had no children. She did her first journalistic work in 1856, when she volunteered to take charge of the literary department of the Houston Telegraph (see TELEGRAPH AND TEXAS REGISTER). She did not become a paid writer, however, until 1863, when she sold the Telegraph a Christmas story translated from German. She began writing stories and magazine articles when the capture and detention of her husband, an agent for the Confederate government, left her temporarily dependent on her own financial resources. From the mid-1870s until 1890, while her husband worked in Washington, D.C., Mrs. Mohl was a correspondent for numerous Texas newspapers, including the San Antonio Herald, the Waco Examiner, the Dallas Herald, Texas Siftings, the Houston Age, and the Dallas Commercial. Her work also appeared in Youth's Companion, the New York Examiner, the Philadelphia Times, and the Chicago Standard. During her residence in Washington, she served as corresponding secretary of the Woman's National Press Association. She was later elected vice president of its Texas division. Houston Post Header, 1909. Courtesy of the Portal to Texas History. Image available on the Internet and included in accordance with Title 17 U.S.C. Section 107. Aurelia Hadley Mohl's Headstone. Image available on the Internet and included in accordance with Title 17 U.S.C. Section 107. Frederick Mohl died in 1891, shortly after returning to Houston, and in 1892 Aurelia Mohl became society editor of the Houston Post. She helped organize the Texas Woman's Press Association in 1893 and was elected its president in 1895. She joined other prosuffrage women in issuing the call that resulted in the formation of the Texas Equal Rights Association in 1893. She also was a member of the Ladies' Reading Club of Houston and of the Texas Woman's Congress. In addition to newspaper features and short stories she published poetry and essays and was the author of Women of the Texas Republic and Revolution, a series of biographical sketches commissioned for a history textbook but not published. She died in Houston on October 3, 1896. Elizabeth Brooks, Prominent Women of Texas (Akron, Ohio: Werner, 1896). Galveston Daily News, June 18, 25, 1893. Gulf Messenger, November 1896. Aurelia Hadley Mohl, Essays (MS, Dolph Briscoe Center for American History, University of Texas at Austin). Handbook of Texas Online, Judith N. McArthur, "MOHL, AURELIA HADLEY," accessed April 24, 2019, http://www.tshaonline.org/handbook/online/articles/fmoae.